If you have several missing teeth, dentistry offers three time-tested ways of replacing them: Dental implants, removable partial dentures, and fixed bridgework. Only one of these, however, will give you the security of a lifetime replacement — while preventing bone loss in your jaw: dental implants. Dental implants stay securely anchored in your jawbone, for tooth replacement that looks and feels completely natural. Partial dentures, on the other hand, need to hook onto existing teeth, which can stress those teeth over time and cause them to become loose and even fall out. Fixed bridgework, likewise, can weaken the natural teeth that are used as supports: In order to hold a bridge in place, we need to file down and crown (cap) two or more natural teeth — at least one on either side of the gap left by a missing tooth. This may cause those support teeth to become more susceptible to decay or need root canal treatment. 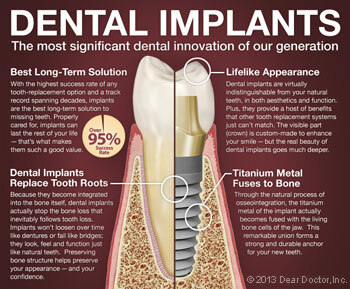 Implants never decay or need root canal treatment because they are made of titanium, a highly biocompatible metal. Dental implants are placed in your jawbone, where they act as roots for your replacement teeth. They are not visible because, just like natural tooth roots, they lie beneath the gum line. Only the lifelike dental crowns that are attached to them are visible to you or anyone else. 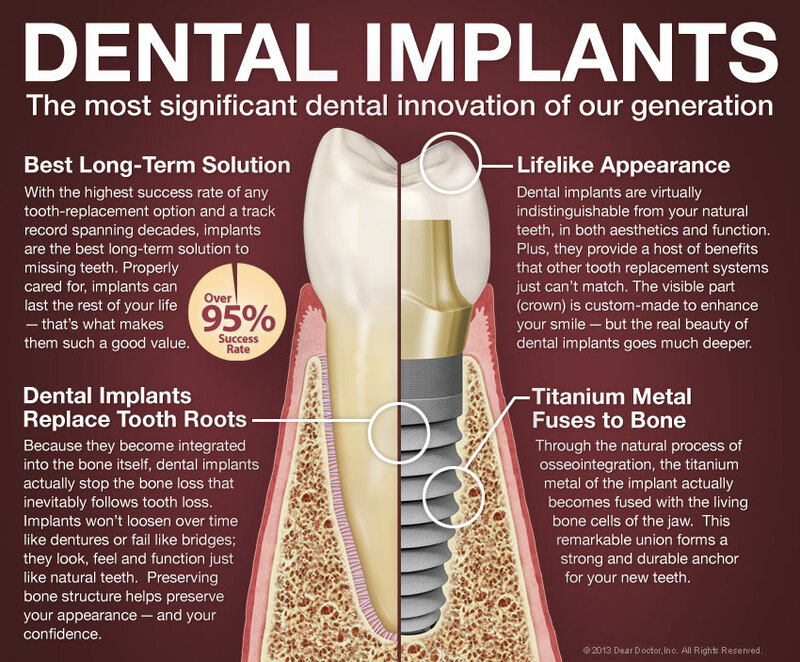 The implants will actually fuse to your jawbone through a process known as osseointegration. The attachment formed will be permanent. 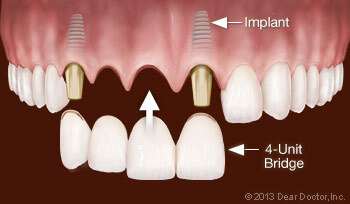 You do not necessarily need one implant for every tooth you are replacing. If the teeth you lost were all right next to each other, we may be able to create a dental bridge using implant teeth rather than natural teeth as supports. To do this, we will place implant teeth on either side of the gap left by your missing teeth. The remaining space between the implant teeth will be filled in with as many dental crowns as you need to bridge the gap. In other words, you will have a row of completely convincing prosthetic teeth, but only some of them will have implant “roots” beneath them. If your missing teeth are scattered throughout your mouth, however, you may need to have individual implants placed for each one, or a combination of bridgework and single implants. We will go over all of your options in detail with you. Dental implant surgery is a simple, routine procedure carried out in the dental office under local anesthesia in most cases. If you need to have failing teeth removed, that will be done first. After numbing the area, implants will be placed in your jaw at precisely planned angles and positions to maximize support and avoid anatomical structures such as nerves and sinuses. Depending on how many implants you need, the surgery can take anywhere from one to three hours. Most people who have dental implants placed find that any post-operative discomfort can be managed with over-the-counter anti-inflammatory medication such as ibuprofen or acetaminophen. Some don't need any medication at all. Usually, the implants will be left to heal for several months before any teeth are attached. During this time they will complete the process of osseointegration. You will need to go easy on your new implants during this crucial healing phase to ensure the best results. We will advise you as to what foods you should temporarily avoid. Of course, once the implants have fused and the permanent crowns are attached, you will be able to eat anything you want! At that point, the only thing you will need to do is take care of your implant teeth just as you would your natural teeth — with regular brushing, flossing, and periodic professional cleanings at the dental office. That is the best way to ensure your implants last for a lifetime.